Functionality, innovation and simplicity, perhaps, are the cornerstones of Japanese design. In a country known for its interiors, careful management of these elements brings projects that work both in function and in form. Moreover, design influences everyday life in Japan and creates customs for the home and how people live in it. Even if you are moving from Japan, that does not mean that you can’t include Japanese elements in your home. We give you some home improvement ideas that could help you keep the Japanese spirit. What home improvement ideas can we borrow from Japan? In Japanese interiors, minimalist decor, light woods and white surfaces are popular. The combination of these elements contributes to the look of the Japanese tranquility award in their homes. Light woods, such as maple or hinoki help to increase the light in the room. Combine the light wood with clean white paint, tidy surfaces and chairs that you can see through, and you have your own piece of tranquility. If you really want to bring Japanese design sensitivity to your home, you need to learn how to love empty spaces. 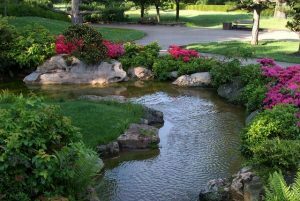 Open spaces allow us to breathe and allow our mind to wander, rather than linger on what is there. The emptiness in traditional Japanese design is a reminder to value the unfilled space and balance in the house. The next time you want to decorate an empty wall or put shelves, look around, take a context, breathe in and think about what you can leave out, not what you can put. Another reason why emptiness is considered positive is that it provides a space for understanding the details and skills. Japanese culture is still heavily influenced by shokunin katagi (“artisan’s spirit”), with particular attention to detail and aesthetic beauty. Even Japanese breakfast boxes, known as bento boxes, please the eye. The term artisan extends to all professions, from design professionals to cleaners, each of whom achieves a simple and attractive result. Although it can be difficult to fill your home with just examples of great craftsmanship, working in separate parts can give your interiors a sense of individuality. Look for local artisans to fill your home with character and history. The Japanese believe that the aging process adds to the beauty of wooden furniture, so do not forget to cherish everything that you buy. The key principle of Japanese design is to create a flow between indoors and outdoors, to appreciate both. The Japanese have a finely tuned respect of the seasons, so the ability to respond to their changes is an integral part of many houses. Shoji screens are an insert of wooden frames with a see-through material, such as plastic or paper. These screens not only help maintain the fluid boundary between spaces but also serve to illuminate and increase the sense of space while maintaining privacy. 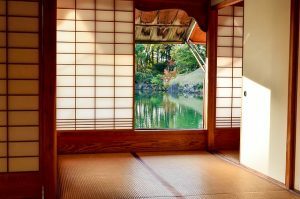 For a look resembling shoji screens, which allows more light, consider steel doors and windows with smaller rectangular glasses. Another way to build a personal space and bring nature to the house is a seat near a window that offers a place for peace. Whether it’s for work or pleasure, a personal corner can be a great way to use an otherwise empty space. If the budget allows, you can invest in a built-in seat. Or you can just lay aside a small space with a large potted plant or a simple bookshelf and add a floor lamp and chair. Increase the comfort with a small side table, a small rug and a blanket for the chair, and you have a place just for you. Another way to incorporate nature into everyday life is to put house plants, whether it be hanging or in pots. If you have space, create your own wall. This is one of the best home improvement ideas, that will make you feel calmer in no time. Japan is famous for its strict and often complex customs, but the rule about shoes inside the house is quite simple. Most people in Japan have shoes for outside and shoes for inside or slippers. The presence of shoes for inside is one way to keep your house looking untouched and free of dirt. And that is really important in Japanese homes where they often use lined futons and tatami. However, because of this, there is a need to store all this footwear. The ladder, in which each step has a box inside, is an excellent solution. Bamboo is a material that we often associate with the Pan-Asian style, and Japan has traditionally been its big fan. Bamboo works perfectly in the open air, as a means of adding a natural function and creating privacy. Invest in non-invasive bamboo plants for your garden or balcony and create a border around the living room. Indoors, bamboo works as decorative material. Use the bamboo blinds in the summer to keep cool or use stronger stems as hanging rails. Both for clothes and in the kitchen, rather than ordinary stainless steel. 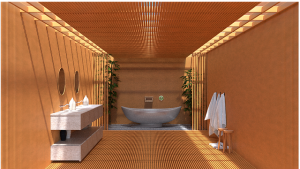 Bamboo dividers can also break down the space for the bathroom, creating a separation between the toilet and the sink and adding a touch of Japanese style. How to implement those home improvement ideas? Well, first of all, you don’t have to implement all of them. Choose the ones that you like the most and that you can afford. And if you need to transport something (bamboo, maybe), hire sea freight forwarders in Japan to help you with that. That way you can make sure that you will implement Japanese home improvement ideas completely.